Best traders have stocks to short in their watchlist in almost every situation. They are prepared to trade market the both ways. They know how to make bearish stock trades and short stocks for a profit. Profitable online trading could be done only with bullish trades. But the market is not only bullish in situation and trend. It experiences weeks and months of strong declines when live market prices signal negative outlook and further declines during many days. The range-bound or non-trending market picture is also often presented by market indexes. The very known definition tells us that the market is more then 70% of the time without a significant or prevailing trend. These days offer many market tickers that present themselves as good opportunities for bearish trade , i.e. to sell short these shares. 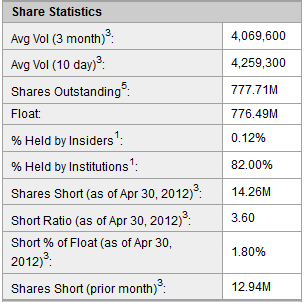 The share short interest is a value that is available on almost all online trading websites. This screenshot shows an example of Yahoo finance stocks quotes site that provide data about short interest for AMGN shares. Similar data can be found also on FinViz – the best online trading site that provides many financial quotes and data for many stocks. The value of the short interest level for any particular company could be a very good indicator about investor opinion about such shares. It could be a very useful value, especially for fundamentally based investor because this value indirectly signals how many institutional investors expect that this price is going to decline. He also add that “…In the interim, however, even a near-valueless stocks can go up sharply due the artificial scarcity of loanable shares.” This means that stocks in bearish trend can also experience pullbacks and counter trend rallies. It is very important to implement strict trade management rules using trailing stop loss or similar techniques to avoid large losses by these strong pullbacks that could be quite violent sometimes. The bearish short sell trade is a risky market activity and so it is very important to manage risk accordingly. Here is more advice from Steve Watson about how to apply risk management for a larger portfolio. “… we spread our short position across so many stocks and use rigorous risk control on our shorts”. And also “…If a ticker is a 1 percent short in our portfolio I’m not going to let it turn into 5 percent loss”. So the most important advice for short selling is to apply very strict and much stronger risk and money management rules for your portfolio.